We love our dogs, and even thinking about trading them in for a “hair-free home” isn’t an option for most people. Still, the build-up of dog hair shed on literally every surface of your house can be a nuisance. First, it’s important to remember that this isn’t your dog’s fault. All dogs shed because they need to get rid of old hair growth. Especially in the winter, your dog will build up a thicker coat of hair that will then shed off as the weather gets warmer and they don’t need those extra layers for warmth. Perhaps you don’t want to keep your dog from going into different rooms, but you might consider restricting them from laying on certain furniture. And if you feel bad banning Fido the floor, consider getting them their own comfy bed — sold at a nearly every large department store and pet store. Daily brushing is one of the best ways to stop the build-up of hair in your home. Plus, most dogs love being brushed! Just be sure to purchase the right tool. There are numerous types, including shedding blades, “Love Gloves,” “Matbreakers,” and more. Read reviews to see which one may be the best solution for your dog and their hair type. Hair often builds up on the carpet and in rugs. And if it has time to spread around the house, it will also have a tendency to gather beneath beds, in closets, and near baseboards. Regular vacuuming will curtail this build-up and will keep the air in your home fresher and cleaner too. For your own cleanliness and appearance, it’s a good idea to keep a lint roller by the door for before you leave the house. Especially if you’re wearing dark colors and have a light-colored dog (or the opposite), dog hair can seem to cling to materials like cotton, wool, and fleece. Lint those hairs off before you head out! Finally, it’s important to clean your dog at least once a month and especially in the summer months. Use a gentle shampoo and give them a soothing scrub and rinse with warm water. This will help keep their coat healthy and will, in some cases, limit fur turnover. The truth is, nearly every type of dog (and cat) will shed. This is regardless of their breed, size, or age. It is true that certain breeds shed more than others, but every dog owner knows the plight of constant lint-rolling, vacuuming, and dusting up hair. 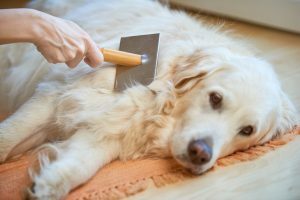 And while you can’t eliminate this annoyance if you want to keep your dog, you can use the tips above to help minimize the build-up and keep your home a little more dog-hair-free. Contact AV Veterinary Center today if you are interested in learning more about proper pet care!